Hurricane’s Coming, Do You Have Insurance? With Tropical Storm (and possibly Hurricane) Isaac heading toward the Florida Keys and Gulf Coast, perhaps it’s time to revisit one of my least favorite topics—namely Citizens’ Insurance. 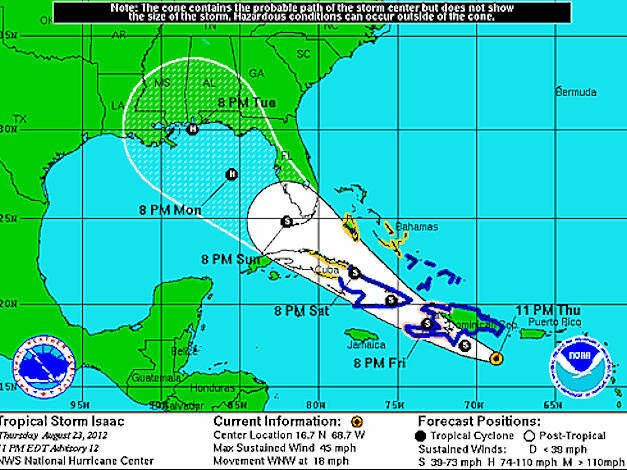 BTW, if you need hurricane coverage or want to increase yours, it’s probably too late now–at least until Isaac blows by. According to the Citizens’ website: No application for new coverage or endorsement for increased coverage may be bound, written or issued, or monies received, regardless of effective date, when a Tropical Storm or Hurricane Watch or Warning has been issued by the National Weather Service for any part of the State of Florida. In a nutshell, the Citizens’ board, appointed by Gov. Rick Scott, has mandated the company to aggressively reduce the number of homeowner’s policies that it underwrites—a program known as “depopulation”. (Sounds sinister, doesn’t it?) As part of this effort, Citizens has dispatched an army of inspectors to find reasons to remove credits for wind mitigation measures or even cancel coverage. It’s a transparent way of circumventing the state law that limits rate hikes for existing policy holders to no more than 10 percent a year. The objective, apparently, is to push homeowners out of Citizens and into the private insurance market, which in hurricane-prone areas like South Florida does not exist. The Miami Herald published a series recently documenting what is going on and the growing storm of protests. It has also reported that increasing numbers of seniors who own their homes outright are deciding to go without insurance because they can no longer afford it. As risky as that is, most homeowners carry mortgages and don’t have that as an option because lenders require that the properties they finance have insurance. Naturally, the enormous cost of insurance is a drag on the recovery of Florida’s fragile real estate market, as the Herald has also reported. In response to a growing uproar, Citizens’ has denied directing its inspectors to disqualify as many homeowners as possible. Last week, a spokesman announced that policyholders who had their credits removed could get a free second inspection, though it was unclear if that would apply to those who had already lost their credits. (Three-fourths of homes inspected have lost their credits.) I think a lot of people will find the charm offensive unconvincing. Despite the flurry of media coverage, it’s still surprising to me that this isn’t a bigger political issue. Property insurance reform was conspicuously absent from Scott’s legislative priorities, and the current Republican-dominated legislature has done nothing to address the issue. Instead, Scott has directed his hand-picked board to deal with the problem administratively, which has resulted in the situation we now face. Citizens’ Insurance was created by the state government to fill a need that the private sector would not take on. Basically, Scott and the Republican legislature have changed its primary mission from one of helping millions of Florida homeowners stay in their homes to one of minimizing risk and maximizing revenue—as the first step to getting rid of Citizens’ entirely. It’s as if Medicare were directed to get rid of as many people as possible by finding any conceivable reason to deny coverage and forcing them into the private insurance market, which wouldn’t accept them because they are old and likely to need medical care. Actually, it’s not hard to see in the Citizens’ story the overarching Republican strategy toward Medicare and Social Security, i.e., to weaken, mismanage, and discredit a government-run institution so that the public loses confidence in it and becomes willing to accept its demise. « Who Buys Political Advertising Airtime in South Florida?